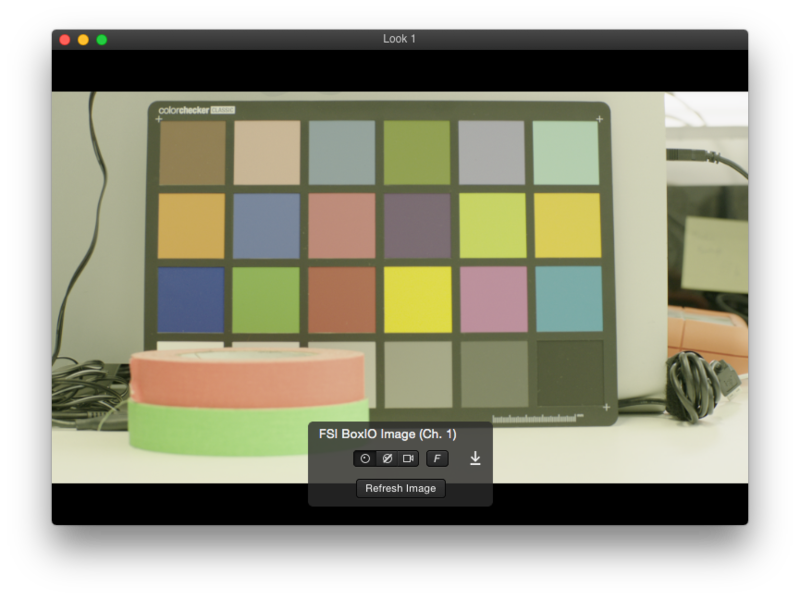 LiveGrade Pro comes with support for Flanders Scientific’s BoxIO LUT box. 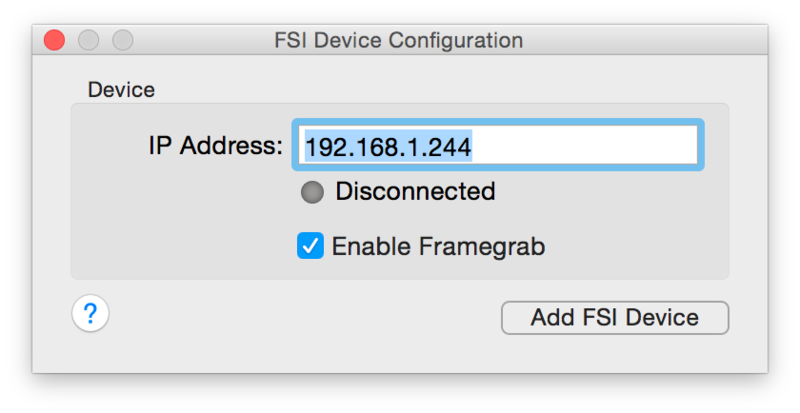 In order to exchange look information with LiveGrade Pro, the FSI BoxIO needs to have a working network connection with the Mac where LiveGrade Pro is running on. The default IP address for BoxIO can be found on the bottom of the device (e.g. 192.168.1.244). Once you obtained the correct IP address, launch LiveGrade and you can proceed to add the BoxIO as a device. In order to do that, you can choose “Slots” in the main menu and then “Add Device”. Alternatively, you can add the device through the Device Manager. The BoxIO possesses two separate processing chains and can be used in so called single- or dual-channel mode. You can learn more about the different modes on the FSI web page. You can change the mode of the device via the BoxIO utility provided by FSI. BoxIO in the Device Manager in single-channel mode. BoxIO in the Device Manager in dual-channel mode. Please be aware that you will have to re-add the BoxIO device after changing modes. Once the gradin mode is changed, hit the refresh button in LiveGrade and you will see the device name indicate the status in the Slots view. While transitioning from single-channel to dual-channel mode delete the BoxIO from the slot and add it again to see two channels populate. While transitioning from dual-channel to single-channel mode simply erase the second device (Channel 2) from the slot. When initially connecting the device in dual channel mode you can switch back and forth between the two modes while always refreshing the devices. Switching into single-channel mode will activate channel one to work solely while channel two will immediately work again when switching to dual-channel mode and refreshing the devices in the slots in LiveGrade. 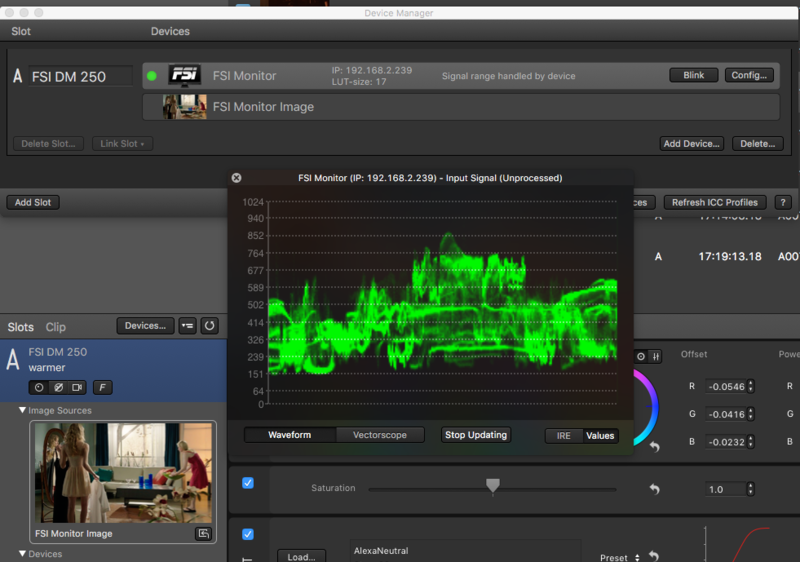 BoxIO is capable of taking a frame grab from the SDI signal that is connected to it. 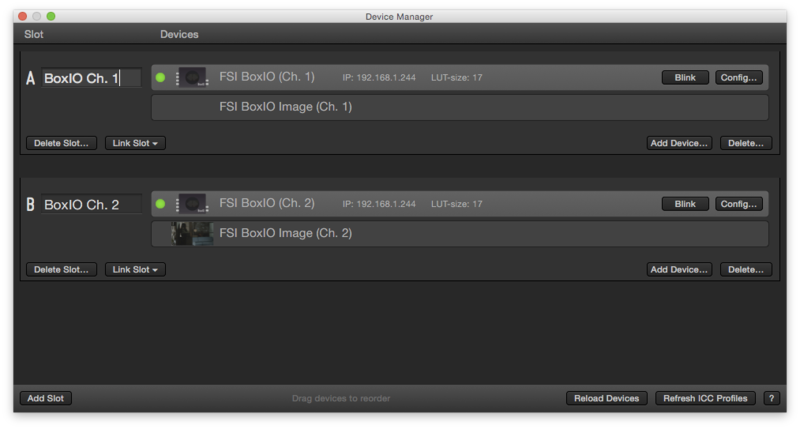 In the main LiveGrade window, the FSI BoxIO is now displayed in the corresponding grading slot as a device, as well as the FSI BoxIO image as an Image Source of the same slot. 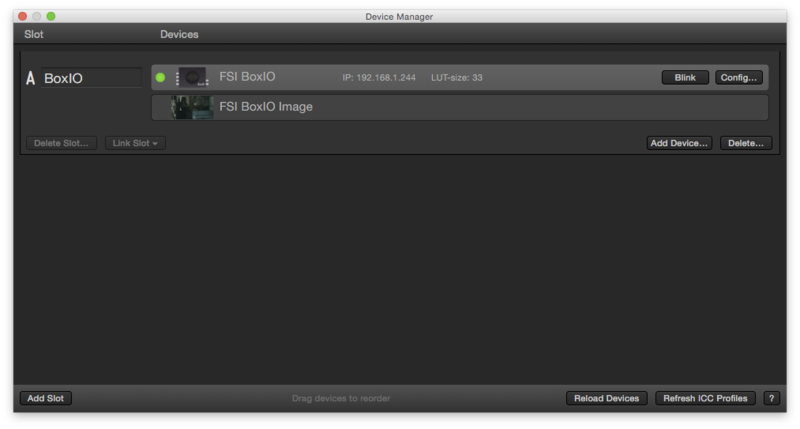 You can open the Image Viewer to display the image by double clicking on the «FSI BoxIO Image» thumbnail. In case that the live image has changed, you can update the image shown in LiveGrade by clicking on the «Refresh Image» button. After that you will have the latest frame of the live image. The signal range set through the BoxIO app. Controling the signal range through the LiveGrade Device Manager. You will now be able to control the signal range inside of LiveGrade. Please refer to the article Legal and Extended – SDI-Signals and LUTs in LiveGrade to learn more about the range control in LiveGrade. You can generally check if the FSI BoxIO is properly connected by going to the Device Manager. A green indicator shows a positive connection status. You can use the «Blink» button to send a red-green-blue screen flash sequence to check if the BoxIO is ready for the use with LiveGrade. FSI BoxIO can also be connected via Wifi. For best performance concerning fluid look interaction and frame grabs we recommend a tethered ethernet connection. The FSI device provides a technology called “ScopeStream” that calculates scopes for the signal on the hardware device and provides it for display on your Mac. 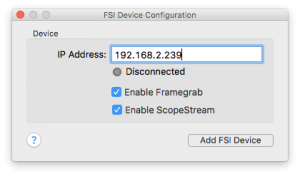 Enable ScopeStream when adding a FSI device. Please be aware that the scopes are drawn from the unprocessed signal. Looks that are applied to the FSI device are not taken into account for the ScopeStream scopes.